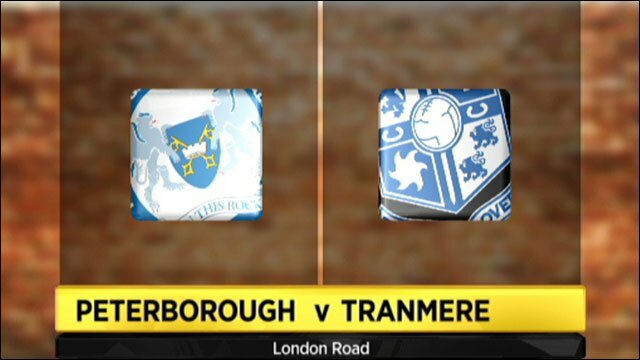 An own goal from Tranmere striker Enoch Showunmi gifted all three points to promotion-chasing Peterborough. The visitors took the lead when Showunmi played a through ball to John Welsh, who calmly slotted home. George Boyd flicked on a Lee Tomlin cross to Grant McCann, who fired in from the edge of the area to equalise. McCann then turned provider when his corner was inadvertently turned into his own goal by Showunmi, which handed the home side the win. "The referee has made the right decision in getting this game on, but in hindsight I wouldn't have gone with all my creative players if I'd known yesterday that the pitch would be in such a state. "You have to be adaptable though, and it's games like today which win you promotion. "We want to try and play a particular way, but sometimes you just have leave your philosophy to one side and go and win the game." "I think it's an indication of how far we've come that we're gutted, we've come to a place like Peterborough and we're so disappointed with a 2-1 defeat. "We did well in the first half and we were disappointed to go in only 1-0 ahead. But in the first 10 minutes of the second half we let them come at us. "You drop off and allow them to do that and I think that was our big mistake." 90:00+3:41 The final whistle is blown by the referee. 90:00+3:16 Substitution Kelvin Langmead joins the action as a substitute, replacing Lee Tomlin. 90:00+2:48 Andy Robinson takes a shot from just inside the penalty box which clears the bar. 90:00+1:58 Centre by Aaron Cresswell, Gabriel Zakuani makes a clearance. 90:00+1:07 Robbie Weir produces a right-footed shot from just outside the area that goes harmlessly over the bar. 90:00+0:30 David Ball gives away a free kick for an unfair challenge on Zoumana Bakayogo. Free kick taken by Tony Warner. 89:40 Grant McCann decides to take a short corner. 85:16 Inswinging corner taken by Aaron Cresswell, clearance by Ryan Bennett. 85:08 Centre by Enoch Showunmi, clearance made by Grant McCann. 84:10 Substitution Tommy Rowe comes on in place of George Boyd. 83:40 Free kick awarded for a foul by John Welsh on Grant McCann. Lee Tomlin takes the direct free kick. 79:10 Substitution (Tranmere) makes a substitution, with Andy Robinson coming on for Joss Labadie. 78:21 Robbie Weir gives away a free kick for an unfair challenge on Grant McCann. Free kick taken by Joe Lewis. 77:06 A cross is delivered by Aaron Cresswell, blocked by Ryan Bennett. 75:09 Free kick awarded for a foul by Robbie Weir on Craig Mackail-Smith. Grant McCann delivers the ball from the free kick left-footed from right wing, save made by Tony Warner. 74:24 The referee blows for offside against Zoumana Bakayogo. Joe Lewis takes the free kick. 74:24 Substitution Robbie Weir comes on in place of Ash Taylor. 73:06 Enoch Showunmi is caught offside. Free kick taken by Joe Lewis. 69:05 GOAL - Enoch Showunmi:Peterborough 2 - 1 Tranmere Headed own goal by Enoch Showunmi. Peterborough 2-1 Tranmere. 67:31 Zoumana Bakayogo has an effort at goal from deep inside the area missing to the left of the goal. 67:19 Grant McCann delivers the ball, clearance made by Ash Taylor. 67:02 Corner taken short by Grant McCann. 66:51 Lee Tomlin crosses the ball, clearance by Aaron Cresswell. 66:02 George Boyd sends in a cross, clearance made by Ash Taylor. 65:13 The offside flag is raised against David Ball. Free kick taken by Tony Warner. 63:52 Craig Mackail-Smith concedes a free kick for a foul on Lucas Akins. Tony Warner takes the free kick. 63:52 Substitution David Ball is brought on as a substitute for Nathaniel Mendez-Laing. 63:52 Substitution Zoumana Bakayogo is brought on as a substitute for Lucas Akins. 63:26 Nathaniel Mendez-Laing delivers the ball. 62:10 Aaron Cresswell sends in a cross, Gabriel Zakuani makes a clearance. 62:01 Aaron Cresswell delivers the ball, clearance made by Ryan Bennett. 61:24 The referee blows for offside against Nathaniel Mendez-Laing. Mark McChrystal takes the indirect free kick. 60:46 The ball is swung over by Michael Kay, Ryan Bennett makes a clearance. 60:37 The ball is sent over by Aaron Cresswell. 58:48 The ball is sent over by Ian Goodison, Ryan Bennett makes a clearance. 57:59 Aaron Cresswell takes a floated corner. 57:45 Craig Mackail-Smith is penalised for handball and concedes a free kick. Free kick taken by Tony Warner. 57:16 Joss Labadie produces a left-footed shot from just outside the penalty box that goes wide left of the target. 56:50 Enoch Showunmi fouled by Grant Basey, the ref awards a free kick. John Welsh takes the free kick. 56:14 Effort from deep inside the area by Lateef Elford-Alliyu misses to the right of the goal. 56:07 Joss Labadie delivers the ball. 54:33 Free kick awarded for an unfair challenge on George Boyd by Aaron Cresswell. Grant McCann crosses the ball in from the free kick. 52:43 George Boyd provided the assist for the goal. 52:43 GOAL - Grant McCann:Peterborough 1 - 1 Tranmere A goal is scored by Grant McCann from deep inside the penalty box to the bottom right corner of the goal. Peterborough 1-1 Tranmere. 52:10 The ball is delivered by Nathaniel Mendez-Laing. 51:39 Grant Basey fouled by Lucas Akins, the ref awards a free kick. Grant Basey takes the direct free kick. 50:33 Free kick awarded for an unfair challenge on Mark Little by Enoch Showunmi. Direct free kick taken by Joe Lewis. 48:29 The ball is crossed by Charlie Lee, Effort on goal by Grant McCann from deep inside the penalty area misses to the right of the target. 46:37 Centre by Mark Little. 46:06 Grant Basey crosses the ball, clearance by Ian Goodison. 45:00+1:29 The referee blows for half time. 45:00+0:52 Corner taken left-footed by Grant McCann. 45:00+0:29 Nathaniel Mendez-Laing takes a shot. Ian Goodison gets a block in. 38:04 Grant Basey produces a cross, Tony Warner makes a save. 37:09 A cross is delivered by Lee Tomlin, Ian Goodison makes a clearance. 36:14 George Boyd concedes a free kick for a foul on Joss Labadie. Michael Kay restarts play with the free kick. 35:20 Aaron Cresswell produces a cross. 34:45 Charlie Lee gives away a free kick for an unfair challenge on Joss Labadie. Direct free kick taken by Michael Kay. 33:22 The ball is swung over by Grant Basey, save by Tony Warner. 29:53 Effort from the edge of the penalty area by Lucas Akins goes wide of the left-hand post. 28:29 George Boyd has an effort at goal from just inside the box that misses to the right of the goal. 27:50 Ash Taylor produces a cross, Ryan Bennett manages to make a clearance. 25:29 The assistant referee signals for offside against George Boyd. Tony Warner takes the indirect free kick. 24:00 Assist on the goal came from Enoch Showunmi. 24:00 GOAL - John Welsh:Peterborough 0 - 1 Tranmere John Welsh fires in a goal from inside the penalty area to the bottom left corner of the goal. Peterborough 0-1 Tranmere. 22:37 Charlie Lee fouled by Joss Labadie, the ref awards a free kick. Grant McCann takes the free kick. 20:39 Michael Kay fouled by Craig Mackail-Smith, the ref awards a free kick. Direct free kick taken by Michael Kay. 19:21 Corner taken by Aaron Cresswell. 18:47 Joss Labadie takes a shot. Save made by Joe Lewis. 18:10 Ash Taylor produces a right-footed shot from just outside the box that misses to the right of the net. 16:55 Nathaniel Mendez-Laing decides to take the corner short, Lee Tomlin takes a shot. Blocked by Mark McChrystal. 16:26 Charlie Lee takes a shot. Save by Tony Warner. 16:02 George Boyd produces a cross, Mark McChrystal manages to make a clearance. 14:31 Free kick awarded for an unfair challenge on Grant McCann by Joss Labadie. The free kick is delivered left-footed by Grant McCann from right wing, Mark McChrystal makes a clearance. 13:06 Nathaniel Mendez-Laing takes a shot. Mark McChrystal gets a block in. 12:33 Enoch Showunmi takes a shot. Save by Joe Lewis. 12:14 The ball is sent over by Grant Basey, Tony Warner makes a save. 11:18 Lateef Elford-Alliyu has an effort at goal from just outside the box which goes wide of the right-hand post. 10:11 The ball is crossed by Michael Kay. 9:42 Joss Labadie takes a shot. Ryan Bennett gets a block in. 8:38 Free kick awarded for a foul by Joss Labadie on Lee Tomlin. George Boyd takes the free kick. 2:04 Foul by Joss Labadie on Grant McCann, free kick awarded. Charlie Lee takes the free kick. 1:44 A cross is delivered by Nathaniel Mendez-Laing, clearance by Michael Kay. 0:51 The official flags Nathaniel Mendez-Laing offside. Tony Warner restarts play with the free kick.